Dr. Kelsey Martin, dean of the David Geffen School of Medicine at UCLA, talks with Maria Shriver at the Wonder of Women Summit at UCLA. 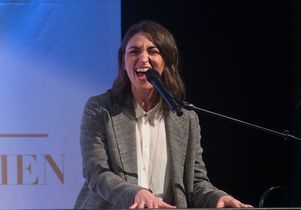 UCLA alumna and singer-songwriter Sara Bareilles blew the roof off a packed ballroom with her powerful performance of her anthem, “Brave,” setting the tone for a day of self-discovery and conversation about mental health at the Wonder of Women Summit on April 11. Johnese Spisso, president of UCLA Health, welcomed 500 attendees to the star-studded occasion, which melded the cream of Hollywood celebrities with UCLA trailblazers in fields ranging from medicine to athletics. Emceed by actress Lisa Kudrow, the event was hosted by UCLA’s Friends of the Semel Institute and Resnick Neuropsychiatric Hospital Board of Advisors at the UCLA Meyer and Renee Luskin Conference Center. The mood, while always inspiring, ranged from playful to profound. Participants shook their hips to a high-energy routine led by Dancing with the Stars’ Julianne Hough, and enjoyed a peaceful group meditation guided by Diana Winston of UCLA’s Mindful Awareness Research Center. 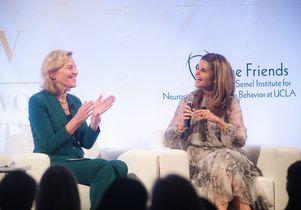 Neuroscientist Dr. Kelsey Martin, dean of the David Geffen School of Medicine at UCLA, shared the stage with Maria Shriver to announce an innovative joint initiative. The Women’s Alzheimer’s Movement, led by Shriver, will support female-specific Alzheimer’s research at the medical school and unravel unique causes of the disease in women. The importance of mothering — of yourself, your friends and your children — was a common thread. Valorie Kondos Field, head coach of the UCLA women’s gymnastics team, and gymnast Katelyn Ohashi shared how their close relationship sustained them through Field’s treatment for aggressive breast cancer and Ohashi’s recovery from a past marred by abusive coaches and painful injuries. Dr. Linda Liau, a mother of two and renowned neurosurgeon-scientist at the Geffen School, had the final word. Singer-songwriter Sara Bareilles performing at the Wonder of Women Summit at UCLA. Bareilles is also a UCLA alumna.